A small glossary providing background information about model cars and their manufacturers, useful hints and references to literature. Special terms used by model car collectors are also explained. Click here for a reference list of the most important books, magazines and internet resources used when creating this website. Code system for special edition model cars, in the beginning mainly used for Matchbox models. 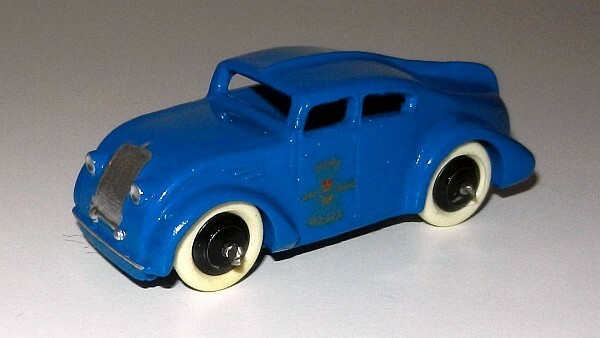 A Code 1 model was totally built by the model car company itself, a Code 2 model was altered with permission of the maker and a Code 3 model was modified without permission. mint and boxed (MB): The model is in the original box, it is in excellent condition and looks like a new one. There isn't any damage on paint and small parts. Value: 100%. mint (M): The model is in excellent condition as well, but the box is missing. Value: 50-80%. near mint (NM): You can see that somebody played with the model. There are slight damages on paint (up to 2% of the painted surface), but no small parts are missing. Sometimes the chrome parts have lost their shine. Value: 40-50%. slightly chipped (SC): larger, distinctive parts of the paintwork are scratched (up to 5%), small parts and decals may be damaged. But the model is complete, no parts are missing. Value: 25-40%. almost trash: Missing parts, broken wheels, bended fenders - such models can only be used as providers of spare parts. Value: 0-25%. The terms near mint & boxed (NMB), very slightly chipped (VSC; between NM and SC) and chipped (C) are quite common, too. Sometimes a rating ranging from C1 (very poor) to C10 (perfect) is also used to describe the condition of a model car. Mass-produced pressure cast ready made models. They are made of an alloy of zinc (predominating), magnesium and aluminium, sometimes with the addition of copper. The moulds are made of hard steel and very expensive. So producers of diecast models have to sell a high number of pieces of each model, otherwise they won't get enough profit. For the same reason, additional parts of diecast models are normally made of plastic in order to keep production costs low. This problem also exists in the model car scene. Since rare models - especially from Matchbox and Bburago - are sold at very high prices among collectors, some people make money by changing paint or decals of cheaper models. The value of a faked model is zero. In most cases repainted older Bburago models are easy to be discovered. Since Bburago sprayed their models with doors, bonnet and luggage hood closed, there is only little paint on the body surface covered by the opening parts. This effect is very hard to imitate when the model is resprayed. 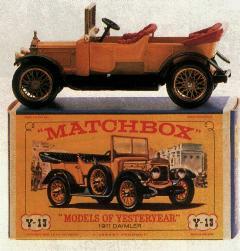 Experts often identify faked Matchbox Yesteryear models by manipulated rivets. 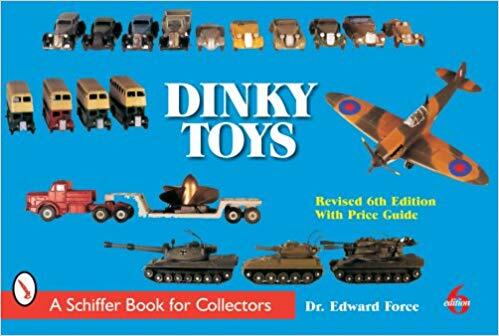 Furthermore, some specialist retailers (model shops and even dealers specialized in Matchbox models) offer literature about Yesteryears that can help when there's the possibility a model is faked. Faked early Yesteryear boxes made with colour photocopiers can often be identified by the wrong cardboard (too solid and much too bright on the inside) and whereas the dark surfaces on the original boxes are dark violet, on the faked boxes they're often black. Artisan-produced models made for collectors only. Only a limited number is produced, and mostly they are made of resin or white metal. Most handbuilt models are made in 1/43rd scale, but there are also models in 1/24th scale and bigger, as well as 1/76th scale and smaller. 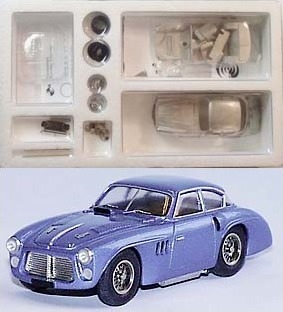 One of the first 1/43rd scale handbuilt white metal models was the Ferrari 250 GTO released in the Marc Europa range, of which Englishman Brian Jewell manufactured about 100 items in 1964. Other pioneers in this field were some more English model makers such as John Day or Mike and Sue Richardson (Mikansue) in the early 1970s. Manufacturers in France and Italy started production of handbuilt models soon afterwards. 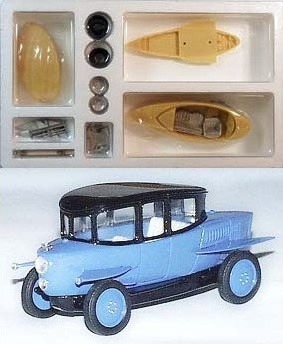 The first model cars appeared soon after the first original cars. In Germany, Märklin, Bing, Carette and other companies already produced detailed tinplate car replicas soon after 1900. These models were toys for the sons of rich parents and were made in rather big scales. They were set in motion by a clockwork or even by a small steam engine. After World War I European toy makers continued producing big tinplate models with a lot of functions. 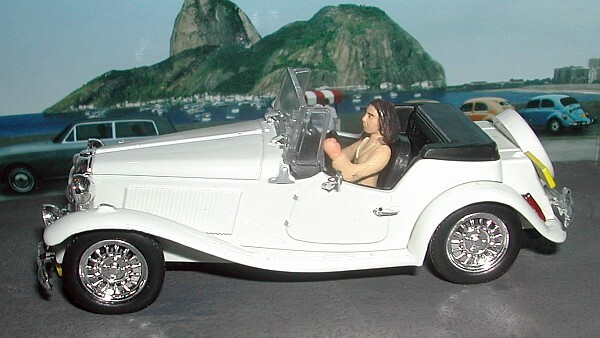 Some of these models became very famous, for instance the detailed promotional models in 1/8th to 1/11th scaled made by the French car comany Citroën in the 1920s and 1930s and the tinplate models made by Schuco in Germany from 1936. Schuco designed models which turned automatically when they reached the edge of a table (the turning limousine), which could be set in motion by air movement (the command car) or which had four forward gears (the Examico). 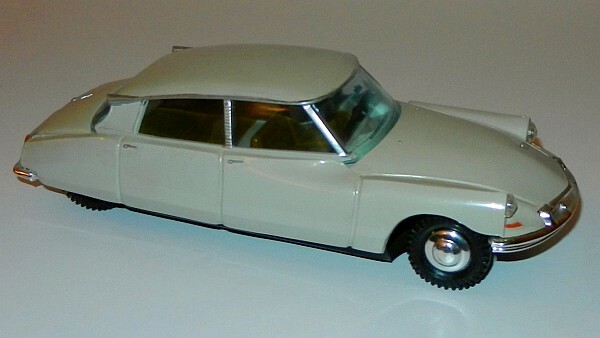 There were also model cars made of lead and later zinc alloys ("diecast") in smaller scales. These models were cheaper than the tinplate models. The American company Tootsietoy was one of the first manufacturers of diecast toy cars, introducing models made of lead in 1911 and models made of zinc alloy in 1933. In the 1930s several companies released their first diecast models in about 1/43rd scale, the scale of the 0-gauge model railways: Solido (France, from 1932), Dinky Toys (United Kingdom/France, from 1934) and Märklin (Germany, from 1935). Two very successful British manufacturers followed after World War II: Matchbox (from 1948) and Corgi (from 1956). In the 1950s tinplate models were still quite important on the toy market. The most successful producers came from Germany (e.g. Gama, Schuco) and more and more from Japan (e.g. Bandai). But a lot of the makers of tinplate cars got into serious economical problems after 1960: The rising wages made the production more and more expensive, and demand for tinplate toys decreased because of a lot of new toys such as slot racers, plastic kits and - later - radio-controlled cars. 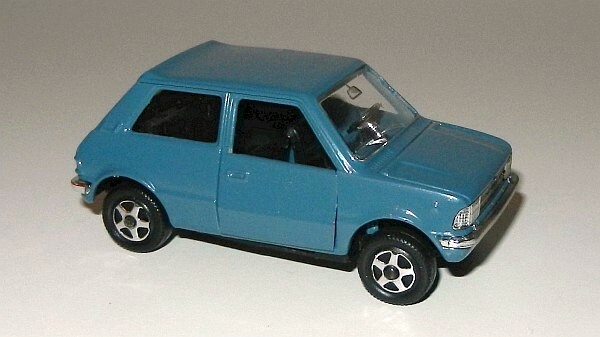 Some tinplate car manufacturers started producing plastic models, others released new ranges of diecast models, and a lot of companies closed down. 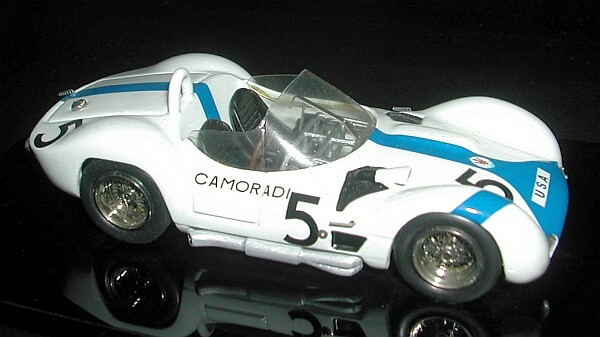 In the 1960s manufacturers of 1/43rd scale diecast models from the United Kingdom, France, Italy and Germany were predominating on the model car market. 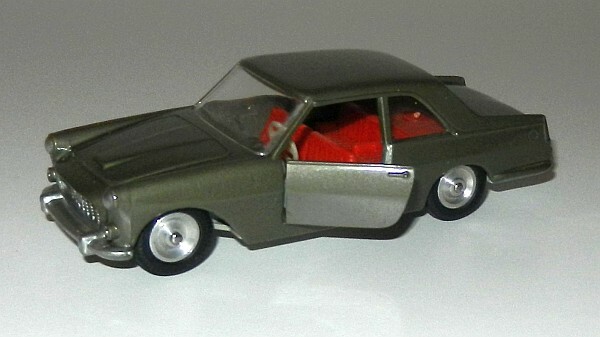 Their models became more and more authentic copies of the originals: Corgi produced models with windows and interior detail from 1956, Solido introduced suspension (Jaguar D-Type, 1957) and opening doors (Lancia Flaminia Coupé, 1961), and Tekno from Denmark and the Italian companies Politoys, Mebetoys and Mercury also released very detailed models. In the 1970s model cars became rather plain again: Authentic wheels with rubber tyres were replaced by one-piece plastic wheels mounted on thin, fast-running axles. The superfast wheels made the models attractive items for children and decreased production costs. This was important because a lot of diecast model manufacturers suffered from the consequences of the recession in the 1970s. In the 1970s a new trend in the model car industry came from Italy: Bburago, Polistil and Mebetoys introduced their ranges of authentic and comparatevely low-priced models in the rather big scales 1/24th-1/25th and 1/16th-1/18th. Apart from opening doors, bonnet and luggage hood these models had no functions. But apparently demand for such detailed big scale models still existed after the era of tinplate cars had ended. More and more adult collectors were interested in such models, too. In the 1980s and 1990s the market reacted to this development. New shops specialized in model cars and new addresses where model cars could be ordered per mail appeared and made it easier for adult collectors to get their models. 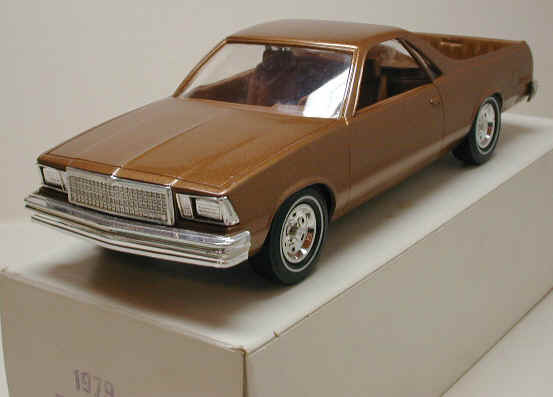 Manufacturers of resin or white metal handbuilt models, as well as some industrial producers such as Rio and Brumm, had already made models aimed at adult collectors in the 1970s, but in the 1990s, new actors in the market such as Minichamps popularized this concept by releasing more and more detailed and authentic models. Not only quality of these models increased, but also the prices. Many manufacturers moved their production to the Far East for financial reasons. Supply of detailed scale models for collectors was increasing, with 1/18th and 1/43rd as the most popular scales. While collectors can find a huge variety of models in 1/43rd scale today, the 1/18th scale models are the best-selling items at the moment since they are even more detailed and are of an impressing size. A new trend in various markets since the year 2000 has been the appearance of partwork series with inexpensive, but well detailed diecast model cars. These models are sold at newsagents or by subscription and are obviously aimed at potential new collectors. Furthermore, new manufacturers such as Spark and Neo entered the market with products situated at the intersection between industrial diecasts and handbuilt models. They craft a wide range of highly detailed resin models in China, corresponding to the finish of European handbuilt models, but sold at distinctly lower prices. As a consequence of this stronger competition, several traditional manufacturers of handbuilt models had to cease production. In 1/18th scale, highly detailed models in a higher price range have become more important in recent years, but quality of the low-priced models in this big scale has also remarkably improved. However, various major manufacturers started releasing 1/18th scale diecast models without opening parts around 2015 in order to keep the prices low. Furthermore, resin has become a more common material for model cars also in bigger scales, which allows cost-effectiveness with lower production numbers. 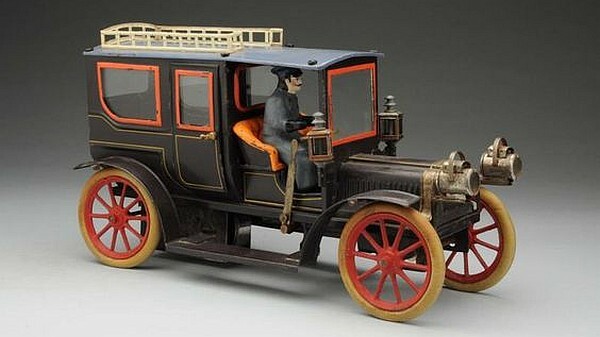 One of the pioneers in the field of 1/18th scale resin models was Ottomobile. You can find information about the development of model car industry in certain countries on the site "Models from all over the World". 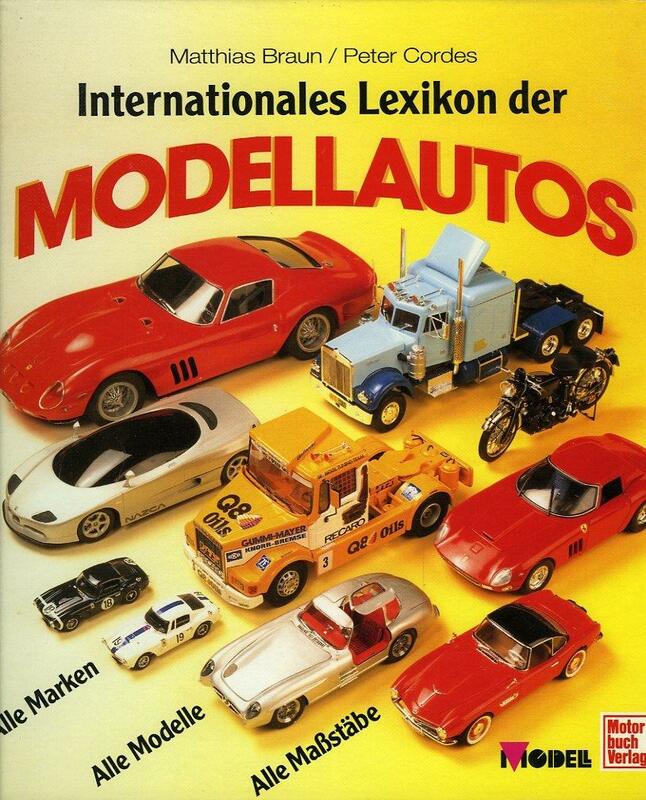 Several books about model cars have been published. The following list - which is not complete - shows some recent and well-known publications about the subject. Most of the books describe the products and the history of a certain model manufacturer. You can find such books at model car shops (e. g. Modelauto), good book shops or online shops such as Amazon. You can find further information about the subject in the internet on websites made by other collectors, clubs and magazines. Have a look at my link page. 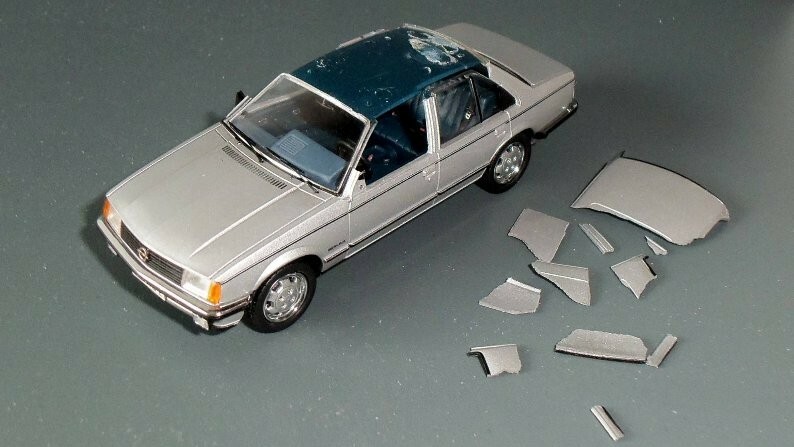 It may happen that diecast models get cracks caused by corrosion. Sometimes they break into pieces. The reason for this metal fatigue is bad quality of the diecast alloy. In most cases models made before 1970 are concerned; later the manufacturers used better alloys. There is no cure for this kind of corrosion. But it is recommended to look for cracks when buying older models and to avoid extreme temperatures and sunlight. A fine and soft brush is the best tool to clean a dusty model. This method makes sure that small parts and decals are not damaged. Dirty models can be cleaned with a soft cloth. If they are very dirty, the cloth can be moistened with a few drops of lukewarm suds. Use q-tips to clean places which are difficult to reach. But never wipe over decals! The German company Momira has developped specialized cleaning systems for the cleaning of model cars, which obtain satisfying results according to test reports. However, model cars with delicate small parts are less suitable for such systems and must be handled with extreme care. Model cars have been manufactured by companies from all over the world. Nowadays most models are made in China, either by European, American and Australian companies who let produce in the Far East for financial reasons or by Chinese-owned companies. However, there are still some manufacturers in all parts of the world who assemble their models in their own countries. The following list includes all manufacturers which are represented in my own collection. Click on the brand names in order to get some information about the companies and to see some of their models. Links to manufacturers' websites are available on my links page. Partworks are periodical, mostly bi-weekly publications sold at newsagents or by subscription which include a collectors' item with each part of a series. There are several advantages of this way of distribution: First of all, it is a marketing strategy to bring collectors to buy a whole series of items, and in most cases the publishers offer special gifts to subscribers in order to make it particularly attractive to get all items. Secondly, the items can be sold at comparatively low prices because the lower VAT rates for print media are applicable: Officially only the magazine is sold and the collectors' item which is attached to the magazine is considered as a "free gift". Finally, selling collectors' items at newsagents instead of specialized shops can be a strategy to introduce new collectors to a hobby. The first issue of a partwork is usually sold at a loss-leader price, the second issue is already more expensive, and from the third issue, the regular price has to be paid. Partworks include all kinds of collectibles, e.g. movies on DVD, figurines, toys, and of course also model cars. 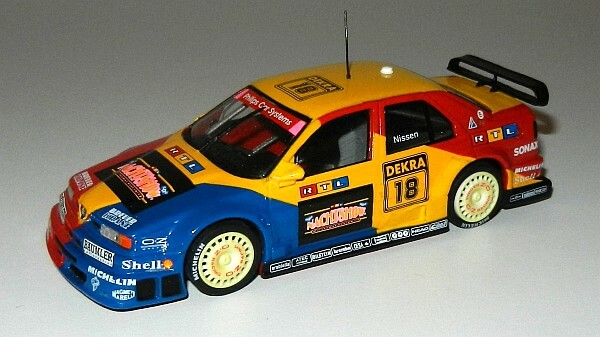 The first partworks including model cars were released in the late 1990s and soon became particularly popular in France, Spain and Italy. In Northern Europe and other parts of the world, however, model car series sold at newsagents have remained quite rare. The most important publishers of partwork series thus come from the South-West of Europe: Altaya (in Spain and France), Del Prado and Salvat (in Spain), Atlas and Hachette (in France), De Agostini and Fabbri (in Italy). 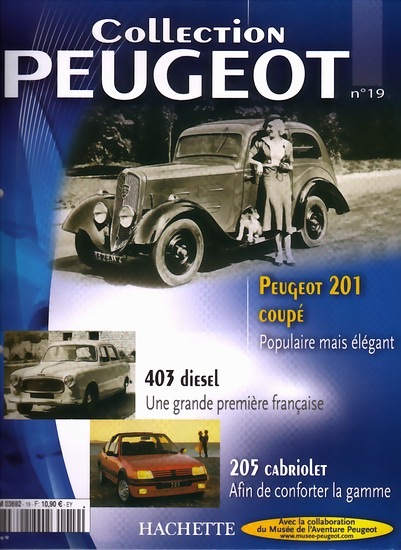 Partwork magazine covers: Peugeot 201 Coupé by Hachette ("Collection Peugeot", No. 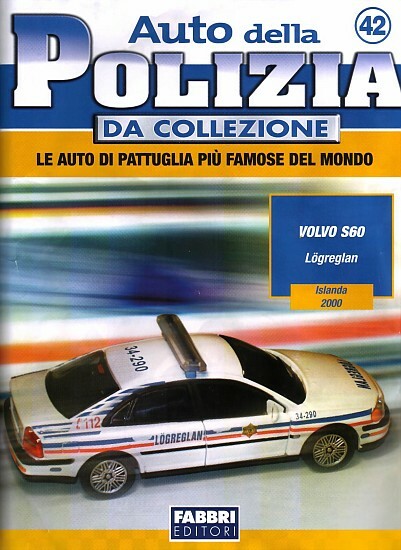 19, November 2006) and Volvo S80 Icelandic police by Fabbri ("Auto della Polizia", No. 42, January 2005). Click on the cover to see a picture of the model car. Model car partworks deal with many different collection themes: road cars from a particular country or car make, police and fire vehicles, rally or racing cars, cars known from movies or comic strips, vans or tractors. One partwork usually consists of 30 to 80 different models, but there are partworks with more than 200 issues. On the other hand, some series are stopped after a few issues if they aren't successful. Most series include 1/43rd scale models, but models in other scales, even in 1/18th, have also been attached to magazines. The most important manufacturers of model cars for partwork series are Norev, Solido, Ixo and Universal Hobbies, other models in partwork series have been made by Hongwell Cararama, Starline Models and other companies. Many partworks include a mix of models from existing moulds and newly developped issues, some of them will be included later in the manufacturer's regular range. 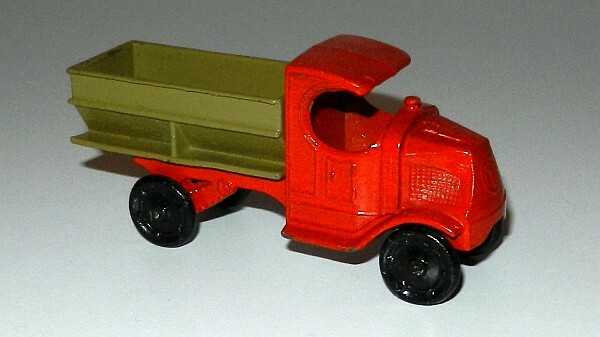 The partwork models are often slightly less detailed than the regular models from the same manufacturer (fewer decorations, plastic instead of photo-etched parts for details such as wire wheels or windscreen wipers, less detailed baseplates), but as they are much cheaper they might still be attractive for collectors. Links to websites providing further information about partworks are available on my links page. Sometimes small parts for details such as radiator grilles, wire wheels, door handles, window frames or windscreen wipers are photo-etched. The parts are drawn in a bigger scale and the pattern is scaled down and is copied photographically on fine sheet metal (steel or brass, 0.15 to 0.3 millimetres thick). Then the parts are etched in acid out of the metal. Using photo-etched parts allows to form better details, but the technology is expensive and was limited to handbuilt models for a long time. Since the mid-1990s mass-producers more and more apply photo-etched parts to their scale models for collectors, too. Models made for a customer, mostly not available in model shops. Promotionals are often used as a means of advertising by car companies - e.g. the 1/25th scale plastic promotional models made by manufacturers such as AMT, MPC and Jo-Han, and later Ertl and Brookfield, from the late 1940s until the 1990s and available from the dealers of US car companies. But model vans and trucks with special printings advertising various products and brands are also popular. Synthetic material used for handbuilt models. Two-part polyurethane (less often polyester) resin is cast in soft rubber moulds mostly lasting only 50 to 100 castings. Compared to white metal or diecast, this material allows the production of less expensive and more complicated castings, but only for a limited number of models. 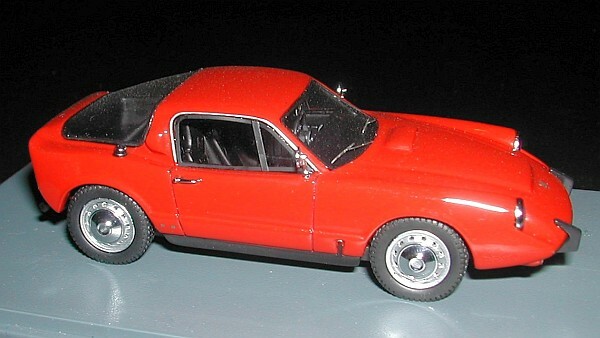 Model cars in scales smaller than 1/87th are only considered as accessories for model railways today. In Germany models in 1/87th scale (matching with the H0-gauge model railway) are predominating (well-known manufacturers: Wiking, Herpa, Brekina, Rietze). Models of cars in this scale are about 5 centimetres long. A lot of toy cars have been made in various rather small scales between 1/55th and 1/76th ("3 inch models", about 7,5 centimetres long: Matchbox, Hot Wheels, Siku, Majorette), but there is also an increasing number of rather detailed diecast models in scales such as 1/64th (very popular in the USA), 1/72nd and 1/76th (models in the latter scale are popular in the United Kingdom, since they match with the British 00-gauge model railways). But most widely spread all around the world is 1/43rd scale (length: about 10 centimetres). Models of this size match with the 0-gauge model railway which was very popular in former times. 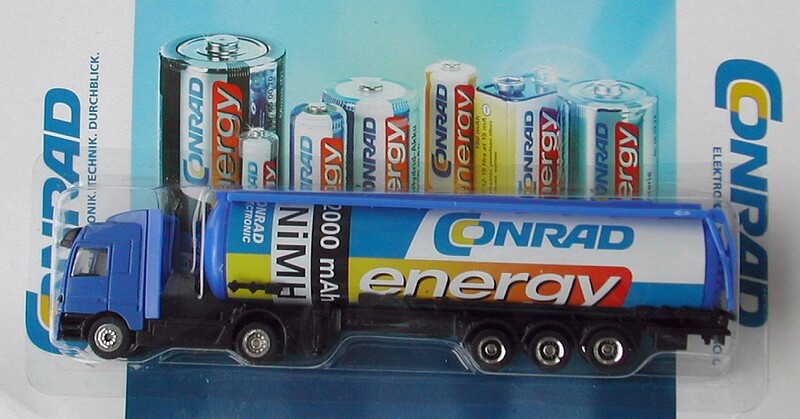 Models of trucks, buses and construction vehicles are often made in 1/50th scale. Models in 1/35th and 1/36th scale were made by the British companies Corgi and Dinky Toys in the 1970s and 1980s (and Mercedes-Benz sold promotionals in the same size), whereas 1/32th scale - formerly a common size for model kits - is only important for slot racing cars and for models of agricultural vehicles today. 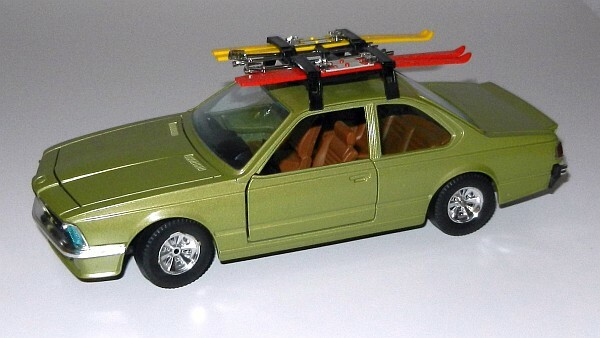 In the 1970s and 1980s 1/24th or 1/25th (length: about 18 centimetres) was popular for bigger scale models. This size is still important for plastic model kits, handbuilt models and in America. 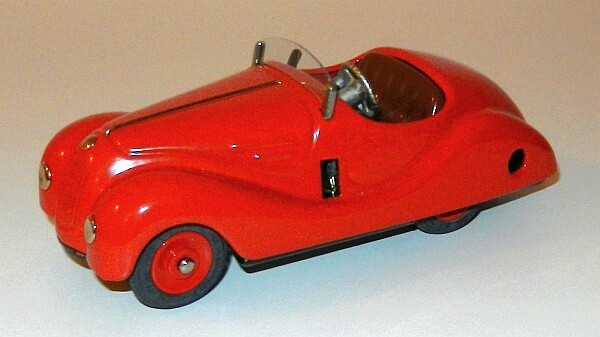 But the success of model cars in 1/18th scale (length: about 25 centimetres) produced by the Italian manufacturer Bburago induced other brands to make models of the same size. Only a few ready-made scale models for collectors have been produced yet in scales bigger than 1/18th. Spare parts for model cars can often be ordered directly from the manufacturer or from the distributor in your country. On the links page page there are links to the official websites of many model car manufacturers, a lot of these websites include some contact information. Addresses of model car distributors in Germany can be found at the "Modellautomobile" website; in Switzerland, the most important distributors of model cars made by various manufacturers are Arwico and Tek-Hoby. Replica parts and spare tyres for obsolete model cars are sold by some specialized companies, e.g. MK Modelcarparts in the Netherlands or Diecast Toyguy in Canada. A model car collector has got at least three problems: dust, sunlight and the question what to do with the model boxes. Showcases provide some protection from dust. They can be bought in most furniture shops, but there are also some specialized shops, e.g. Adro, b+m Vitrinen, Presents Vitrinen, C&S Vitrinen, Animazing, Mancherlei-Vitrinen, Sora and Avitrina (see also this list of sources for display cases in English speaking countries). Sunlight is another problem that mainly concerns plastic model cars: Heat and light may fade colours and distort plastic parts. Finally there is the problem with the boxes. I think you should keep them because a box makes the model complete and increases its value (see condition). A good solution to store a large number of model cars in smaller scales (for which there was no place in a showcase) and their boxes could be cupboards with flat drawers as used for drawing paper or blueprints. White metal models are made of pewter or a similar low temperature metal alloy (consisting of tin, lead and antimony) cast in low-volume hard rubber moulds. White metal models are handbuilt models. They are heavier than diecast models and are only made in small series. Sources of the pictures on this page: Rollo's Modellautohomepage, Amazon, Ebay, Brumm, Schuco, Tin Wizard, the magazines "Modell-Fahrzeug" and "Quattroruotine".